It felt like winter just ended yesterday but we are currently on the cusp of hurricane season, which begins June 1st. So, now is a good time to gauge what has been happening pattern-wise and what trends are in store for the future. While the Northeast was spared from the active 2017 hurricane season, will this year be just as busy? Let’s take a look at the factors that will influence tropical activity over the next several months. Current sea surface temperatures have been colder than average over much of the Caribbean and tropical Atlantic. This combined with warmer than usual waters off the East Coast is not typically conducive for tropical development due to the plethora of storms that emerge from the former region. On the flipside, this does allow for storms to form further north and closer to the coast due to the warmer waters of the Gulf and off of the southeast US coast. However, before we get too far ahead of ourselves, we’ll have to investigate larger scale patterns such as the North Atlantic Oscillation (NAO) and El Niño-Southern Oscillation (ENSO) to see how things may play out. The NAO over this previous winter was largely positive, only going negative during March, of which will be quite memorable due to the “four’easters”. It has trended positive ever since though, and because this NAO state will likely persist, it will reinforce the sea surface temperature pattern mentioned previously. Out in the Pacific, La Niña has had its paws on us all winter and spring. 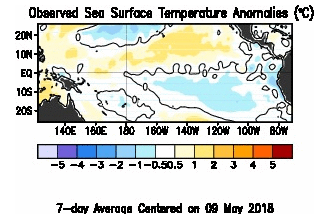 However, there are now signs of warming waters just underneath the surface, which may push the ENSO state into neutral territory or perhaps a warm neutral/weak El Niño scenario. This change is important as El Niño’s tend to produce more wind shear over the Atlantic, which impedes tropical activity. Despite the difficulties looking so far ahead, it is more likely ENSO lands in neutral phase for much of hurricane season, which may not have a large impact on the tropical Atlantic. 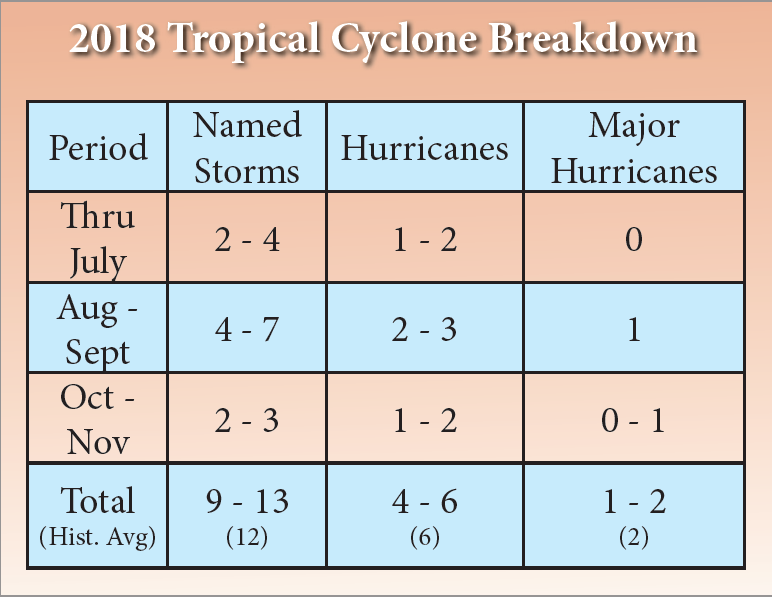 With that said, all of these factors point to an average hurricane season with the above table showing our forecast against historical averages. While regional sea surface temperatures are not ideal for most of the tropical Atlantic, it may end up being balanced out by a neutral ENSO (barring any El Niño development that is). 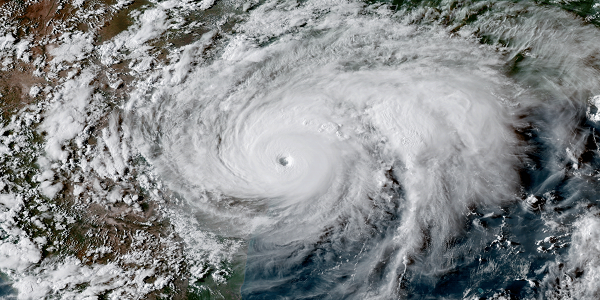 In total, we expect 9 – 13 named storms, 4 – 6 hurricanes, and 1 -2 major hurricanes (Category 3 or higher), all of which fall around climatological values. What does this mean for the Northeast? 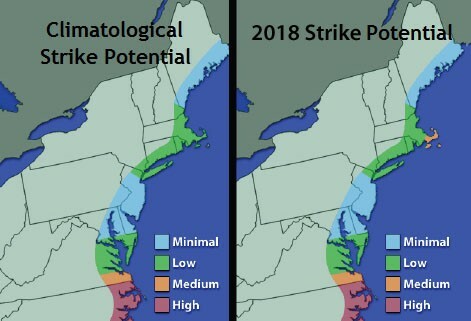 Since we’re dealing with a near average season, opportunities for a direct hit will be mostly in line with climatology as well. Considering waters along the Gulf of Mexico and off the eastern seaboard are warmer than normal, these places will need to be watched for potential tropical systems. Most times, these set-ups tend to result in close brushes with the Carolinas and east towards Cape Cod. To be clear, don’t let a fixation on the above strike potential and an “average” hurricane forecast lure you into a false sense of security. Any hurricane can be impactful, and with storms like Harvey, Irma, and Maria fresh in our minds, it is important to always stay vigilant as it only takes one storm to inflict damage across our area.